Lieutenant Colonel Charlie Stickland joined the Royal Marines in 1987. His initial appointment was with K Company, 42 Commando RM as a rifle troop commander which included an operational tour in Northern Ireland. Following an in-service degree course he specialised as a landing craft officer serving with 539 Assault Squadron Royal Marines and then in Hong Kong directing anti-smuggling operations where he also became the Naval Staff Operations Officer. On returning to UK and 3 Commando Brigade he spent time in 40 Commando RM, based at Taunton, as the operations officer and then as a company commander deploying to the Far East, Jordan and the Mediterranean rim. Two years at Staff College followed propelling him into a period in the Ministry of Defence in London. Firstly, in procurement and then on promotion to Lieutenant Colonel he became the MoD lead for West and Southern Africa developing cross-government policy in sub-Saharan Africa and co-ordinating military activity across the region. In July 2005 Lieutenant Colonel Stickland joined the staff of Commander UK Amphibious Forces. This involved an operational deployment to Iraq as part of the Multinational Division (South East) where he served as the UK Senior Liaison Officer with the United States 18th Airborne Corps in Baghdad. He was then appointed Chief of Staff 3 Commando Brigade 2006 and for seven months served as the Chief of Staff of the UK Task Force in the Helmand Province of Southern Afghanistan. On return all focus shifted to rebalancing the Brigade and reinvigorating the formation’s amphibious skills. 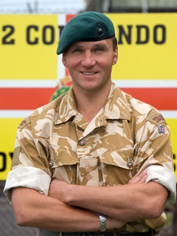 Lieutenant Colonel Stickland assumed command of 42 Commando RM on 8th January 2008 and almost immediately deployed with the Unit to Norway. This deployment was not only for the Unit to regain its Mountain and Cold Weather Warfare credentials but to start the process of building a cohesive team ready to redeploy to Afghanistan in September 2008. Lieutenant Colonel Stickland is married and has three sons (11, 9 and 7). The Sticklands live near Taunton and are doing up a rumbled down farmhouse. Life revolves around family, be it coaching rugby, building tree houses, skiing or slaying imaginary dragons with wooden swords accompanied by 3 small boys!